A friend of mine, who loved to travel but couldn’t when her children were younger, once told me she made herself feel better by saying, “It’s not my decade.” Once her children grew, she went on a tear around the world. Maybe you’ve been busy raising children or concentrating on your career or the myriad other things that can crowd life. And maybe, because of all those things, you’ve neglected the thing that many people have a hard time finding time for: exercise. If you’ve been sedentary for the past few decades, it’s not too late: a new study indicates that even if you’ve been inactive for years, becoming physically active in midlife can substantially reduce the likelihood of getting seriously ill or physically disabled in retirement. Successful aging. Isn’t that the hope of all of us? Ideally, we want to remain healthy and able to engage in life with as few problems as possible. To remain disease-free, retain our cognitive function and steer clear of depression and disability is a worthy goal. Granted, a good part of health is determined by genetics, but there are several other factors”things that are within our control”that contribute to good health: Â not smoking, moderating alcoholic consumption and exercising. Reynolds also includes having money in that equation, and while it’s clear that people with greater economic resources may have certain health advantages, it’s important to remember that all the money in the world doesn’t guarantee you health. For people of any income bracket, being physically active during our adult years is a very important factor in keeping healthy. One large study of more than 12,000 Australian men between ages 65 and 83 found that those who exercised five or more times a week for about 30 minutes fared much better than those who did not. Fret not if exercise hasn’t found its way into your life yet. More studies find that even if someone ignored exercise earlier in life, adopting the habit now can still pay off. Those who were active and remain that way aged most successfully and had the lowest incidence of major chronic diseases, memory loss and physical disability. But others who were not active in their younger years but start exercising in middle age still profited, with about a sevenfold reduction in their risk of becoming ill or unwell. In fact, researchers found that the health advantages of becoming active were on par with the advantages of giving up smoking. But what if you hate the gym? You need not adopt a formal exercise program, researchers say. To qualify as someone who is “active,” all you need is an hour per week of moderate or vigorous activity, like gardening, washing the car, moderate-paced walked or even dancing. Researchers analyzed data from a 2014 national health survey, focusing on adults ages 50 or older. Over all, about 28% of those people had not exercised in a month. 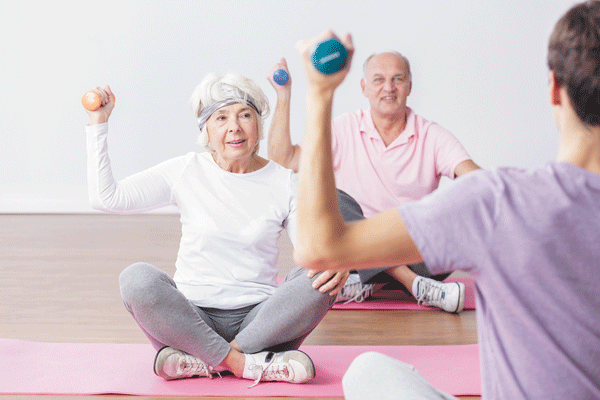 But inactivity increased with age: non-exercisers amounted to about 25% of people ages 50 to 64, about 27% of people 65 to 74, and about 35% of people 75 or older.